Lifeboat 4 is the sixteenth to be launched. Like lifeboat 10, number 4 sat at it's station relatively late into the evening. It was intended to be one of the first launched by 2nd Officer Lightoller. He had planed to lower the boat to the promenade deck and have passengers board there. Therefore, he proceeded to send passengers down to that deck. What he didn't realize was that the windows that enclosed nearly the first half of Titanic's promenade deck were closed. He immediately ordered two stewards to go and find the window cranks so that the windows could be opened. The passengers then were led back up to the boat deck to be loaded into lifeboats 6 and 8. It was about 1:50am when the promenade deck windows were finally opened and number 4 was lowered to the promenade deck just beneath the boat deck. 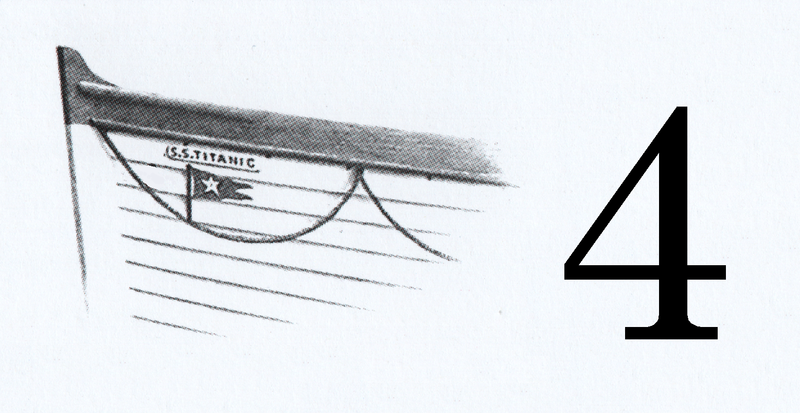 Because of Titanic's list to port, a large gap developed between the ship and the lifeboat. Lightoller ordered the lifeboat to be tied to the side of the ship to bring it closer. He then propped up deck chairs to be use as ladders so that the passengers could climb up and pass through the windows into the lifeboat. When number 4 made it down to the water, a sailor called up to the boat deck requesting a additional hands to man the boat. Quartermaster Perkis and another member of the crew climbed down the falls and took charge of lifeboat 4. Lifeboat 4 leaves Titanic with 30 out of 65 seats occupied.